Gelsenkirchen - Knocked out of the DFB Cup in round one and defeated on the season’s opening weekend, FC Schalke 04 were a club distinctly lacking in confidence heading into their Matchday 2 encounter with champions FC Bayern München. When the 90 minutes were up, however, the mood around Gelsenkirchen was one of optimism once more after a pulsating 1-1 draw, thanks in no small part to the heroic efforts of the Royal Blues’ captain, leader and FIFA World Cup winner Benedikt Höwedes. Schalke are a club perennially considered as one of German football’s nearly men having never lifted the Bundesliga title. In recent years they have boasted squads of undoubted talent but have continued to underachieve on the domestic front, particularly when competing against the division’s bigger fish - most notably the men from Munich. Before last Saturday’s encounter at the Veltins Arena, Schalke had lost their last seven matches against Bayern, scoring just once and conceding 24. This time they found themselves behind yet again when former Dortmund marksman Robert Lewandowski opened the scoring, and his Bayern account, with a first-half tap-in. Inspired by Höwedes, though, Jens Keller’s charges managed to lift their heads up, get in amongst Pep Guardiola’s star-studded cast and take a well-earned share of the spoils. 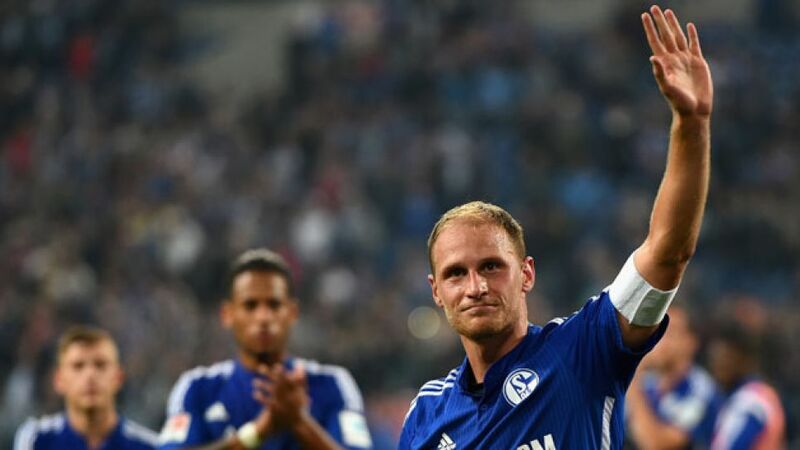 Höwedes personified the commitment, emotion and dedication for which Schalke’s famously passionate support are known and his approach brought out the best in his team-mates. At the final whistle, the hosts had won a collective 52 per cent of their challenges and run 122 kilometres, 6km more than in their Matchday 1 loss in Hanover. “We have to make sure that we do this against every team in the league, not just against Bayern,” surmised fellow World Cup winner Julian Draxler. In contrast to Draxler, however, who played a bit-part role in Germany’s triumph in Brazil, 26-year-old Höwedes did not miss a single minute of die Nationalmannschaft’s seven games, contributing as much as anyone to his country’s fourth World Cup triumph, even in the unfamiliar position of left-back. The experience has moulded and matured him into a better player and, on last week’s evidence, the undisputed leader in the Schalke camp. Indeed, before, during and after the Bayern game, he displayed the type of leadership that made him Joachim Löw’s preferred option in the summer. He led a team meeting before the game and appealed to the players once more at half-time, while also filling in at left-back, right-back and centre-back on account of personnel deficiencies during the 90 minutes. “I’ve got no problem with helping out on the left on the right when I have to,” says the Haltern-born player.